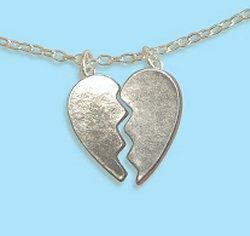 Heart pendant sets can be split between friends. Sterling silver pendant sets are a great gift for a special person, whether they wear the entire set or if it split between two friends. With a tremendous variety of choices available, there is a gorgeous jewelry set available to match anyone's style preferences. Sterling silver jewelry, including pendant sets, is a great choice for all wardrobe types and design favorites. Composed of an alloy between silver and copper (generally less than 8 percent copper), sterling silver is more durable than pure silver, which is not only soft but also more prone to tarnish. At the same time, sterling silver is still malleable enough to be used for a wide variety of intricate and beautiful shapes, and the subtle white color can match any colors of precious stones or other accent details. The focal point of a pendant set can be just about anything that is meaningful to the wearer. In addition to different accents, there are a number of different styles of pendant sets. Each one naturally includes the necklace, but what other types of jewelry complete the set can vary. Earrings are a popular choice, either studs or more elaborate dangle earrings. Matching anklets are a great option for trendy pendant sets. A coordinating ring is a beautiful piece to match to a pendant. Bracelets are easy to match with pendants or other jewelry sets. A pendant set may includes several pieces of coordinating jewelry; as long as each piece has the same general focal point, they will make a beautiful set. The key to another's heart. Several types of sterling silver sets are more symbolic than just being coordinated pieces of jewelry: they are two matching or complimentary pendants. A heart or oval may be printed with the words "Best Friends Forever" and then split in half, for example, for two friends to wear at the same time. Another popular couples design is to create a heart and a key that sweethearts can share - one of them literally wears the key to the other's heart. A third type of specialized pendant set is one where the pendants are identical but one is scaled to smaller proportions than the other - this is a lovely mother and daughter jewelry set. With so many beautiful options for sterling silver jewelry sets, it is no surprise that they make lovely gifts. A set that focuses on a particular birthstone, for example, is a perfect birthday gift. A parent may give a set to a daughter on her birthday, for a first communion or confirmation, or for any other special occasion. A soon-to-be-bride may give coordinated sets to each of her bridesmaids for a matching wedding look, or a mother may give her daughter a set on her wedding day. Friends may split a pendant set when one moves away, they separate after graduation, or anytime they share a special bond. Even without a special occasion, sterling silver pendant sets are a superb gift just because. Pendant sets can be found at traditional jewelers, online jewelry stores, and discount retailers. Costs range from less than $30 to as much as $100 or more for sets using real gemstones and with finer details. Generally speaking, more expensive sets are higher quality, but less expensive sets are great options for kids and friends. Simply finding sets can be difficult, however; it is best to search for a specific type of set - best friends pendants, birthstone pendant sets, etc. - to narrow down the choices. Sterling silver pendant sets are beautifully coordinated jewelry that makes a great gift for friends, lovers, or anyone special, and with so many choices for lovely sets, there is a gorgeous design available for everyone.